Bill McCreedy, president of the Gallia Gun Club and Tom Meadows, Officer of the Year committee chairman, present the Kimer 45 to Officer of the Year Trooper Russell Landrum. 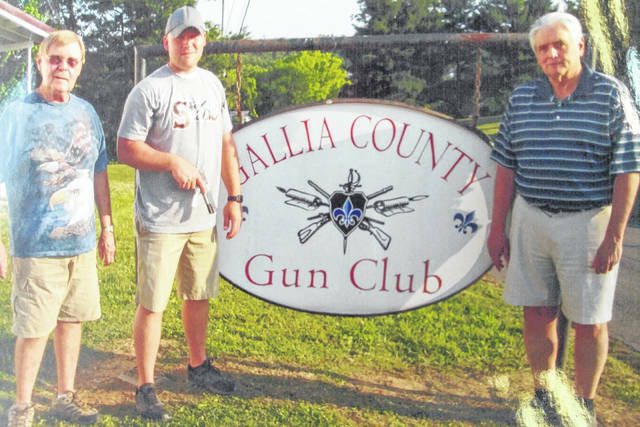 BIDWELL — On June 7, the Gallia County Gun Club held their annual Officer of the Year dinner. There were 84 Gallia officers, judges and club members in attendance. All were treated to dinner. After dinner, the Gallia Gun Club honored Trooper Russell L. Landrum of the Ohio State Highway Patrol as the Officer of the Year for Gallia County. He was presented a Kimber 45 pistol and his name will be engraved on the gun club’s Officer of the Year plaque. The club regards Landrum as a dedicated officer whose main goal is to make all public highways safe for travel. Landrum was elected for his diligent work at apprehending impaired drivers and illegal narcotics. Landrum has excelled in these areas and leads within his assigned district and across Ohio in removing illegal narcotics and felons from the roadways in Gallia County. The gun club sees Landrum as not only a leader in the post but across his district and the state. The club feels that Landrum takes pride in being able to help fellow officers and pas along his knowledge. He works vigilantly even when tired on the midnight shift.